Download this conference presentation titled, "ISO 26262: What to expect from your chip or IP provider", presented by Arteris IP Functional Safety Manager (FSM) Alexis Boutillier and VP of Marketing Kurt Shuler at the Automotive IQ Guidance of ISO 26262 to Semiconductors, on 11 June 2018, Ann Arbor, MI. 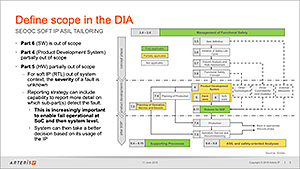 Provides “lessons learned” regarding the ISO 26262 deliverables that Tier-1s and semiconductor vendors should expect from their suppliers. Practical advice is given regarding DIA and Safety Manual contents, as well as FMEDA expectations for configurable IP. Authors: Arteris IP Functional Safety Manager (FSM) Alexis Boutillier and VP of Marketing Kurt Shuler.